Located on the 6th floor of the cultural center, the Terrace boasts unrivaled views of the Chicago Skyline from the Edgewater Hotel to US Cellular Field. The original stone balustrade is adorned with white lights and flower boxes. Perfect for small ceremonies, wedding photographs or as an additional "wow" space for guests, the Terrace can be added to any space. No glass allowed, only plastic permitted. Rentee is responsible for providing plastic plastic cups. 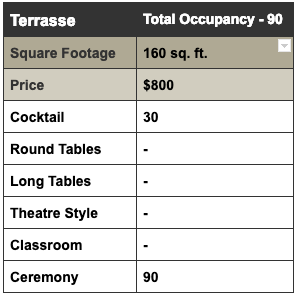 No chairs are allowed on the terasse. Discard cigarette butts in the cigarette receptacles AND not in our planters. Do not relocate planters, lights or benches. Any of these violations could cause the terrace to be closed down without refund.